Prof. Dr. A. Q. Mughal, born on 7th January 1944, is a Research Professor at Greenwich University. He was previously Vice Chancellor and Pro-Vice Chancellor of Sindh Agriculture University, Tandojam. He is the first Professor Emeritus of the Agriculture University. Before his appointment as Vice Chancellor, he was serving as Advisor, COMSATS Institute of Information Technology (CIIT) Islamabad since 2004. He has also served as Advisor (P&D), Advisor (Academics), Member (WT) and Chairman of the erstwhile University Grants Commission of Pakistan; and as Member (Academics/R&D) and Executive Director of the Higher Education Commission of Pakistan. Dr. Mughal has received a high quality education from the most prestigious international institutions. On his meritorious work in the field of education & research Dr. Mughal has been awarded ‘Azaz-e-Fazeelat’ in 2000 and a Civil Award ‘Sitara-i-Imtiaz’ in 2014 by the President, Islamic Republic of Pakistan. Prof. Mughal graduated from University of Sindh in 1966 and received M.Sc. Honors in 1970. He also received M.S. degree from the American University of Beirut, Lebanon in 1975. In 1979, Dr. Mughal was awarded World Bank Fellowship. Under this program he earned Ph.D. from the Cranfield University, UK in 1983. Dr. Mughal also won the Fulbright Research Award in 1989 for post-doctoral research at the Iowa State University, Ames, Iowa, USA. Dr. Mughal has acquired professional experience by attending national and international conferences, seminars, workshops and trainings all over the world. His training on Planning and Appraisal of Agricultural Projects at Pakistan Institute of Development Economics, Management for Agricultural Research Technology at the Iowa State University and Crop Modeling Training at the University of Florida, USA are notable. 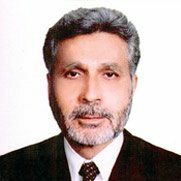 Dr. Mughal possesses rich experience of 47 years (BPS 17 to 22) in the administration and teaching of higher education, basic and adaptive research, and planning and appraisal of research & development projects. Two models: ‘Clinic-Hospital system for back-up service for farm machinery’ and ‘An approach to small holder mechanization research and development in Pakistan’ are already to his credit. His experience, as a Visiting Scientist at the National Soil Tilth Laboratory USA, working on the development of a Soil Tilth Index and its use in examining the energy efficiency of tillage systems, is getting significance all over the world. On this research, he has been honored with US-1993 ‘Exceptional Merit Paper Award’. Dr. Mughal has also been recognized by ‘Who is Who in the World’. He has produced Four PhDs. in the field of Power & Machinery (Agricultural Engineering), one in 2003, another in 2005, third in 2014 and the fourth in 2015. He was elected Vice President of the Executive Council of Federation of Universities of Islamic World in 2009. Prof. Mughal has also worked as Dean of Agricultural Engineering Faculty for over four years (March’86-August’89 and June’94 to Nov.’95). His management experience also includes working as Chief (Agriculture) for two years (1976-77) in the provincial Planning and Development Department, entrusted with the task of planning and execution of agricultural projects in Sindh province. He has served as Chairman and Member on various management bodies of the University. He has also served on the Executive Council of Pakistan Society of Agricultural Engineers and Pakistan Engineering Council. Dr. Mughal fully participated in preparing the ‘Education Policy 1998-2010’ and was a Member of the ‘Task Force on Improvement of Higher Education in Pakistan’ constituted by the Government of Pakistan in 2001, which resulted in the establishment of Higher Education Commission of Pakistan. Dr. Mughal is a prolific writer and researcher on a wide variety of agricultural subjects particularly on Farm Machinery Management, Soil Tilth Management, Use of Energy in Agriculture and Sustainable Agriculture. He is an Editor-in-Chief of two Journals: ‘New Horizons’ and ‘Business Strategies’, Research Journals published from the Greenwich University. Dr Mughal is a Member on the Editorial Board of International Agricultural Engineering Journal published from AIT Bangkok, Thailand and Co-editor of Agricultural Mechanization in Asia (AMA) Journal, published from Japan. Dr. Mughal is Founder Member of the Asian Association of Agricultural Engineering (Thailand), a Life Member of the Pakistan Engineering Council and Agricultural Foundation of Pakistan. He is also Member of the American Society of Agricultural Engineers, Sigma Xi, a Scientific Research Society of USA, and International Soil Tillage Research Organization of the Netherlands.